Last October, I ran a marathon. It hurt, a lot. 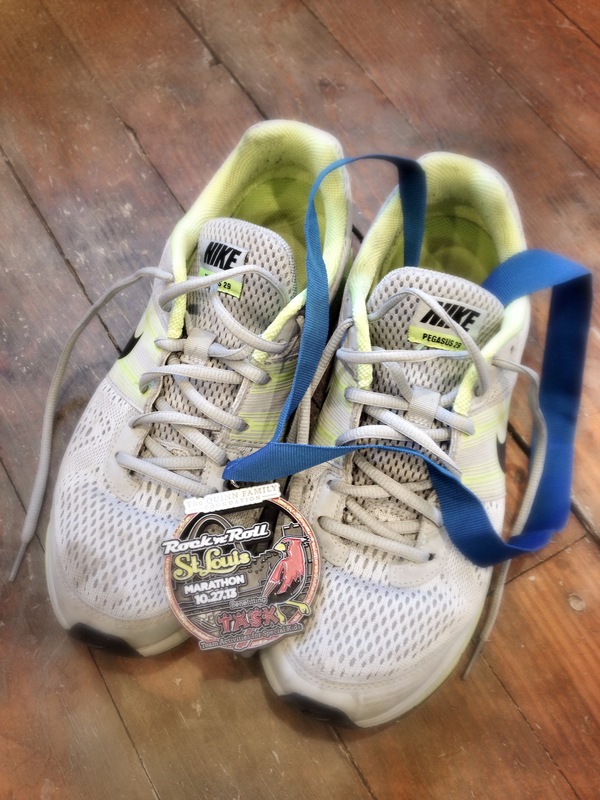 I spent most of the race in agony, telling myself that I would get a blog post out of the experience, at the very least. That, and one of those smug “26.2” stickers to put on the back of my car. I never did get one of those stickers (couldn’t bring myself to, in the end) but here, at long last, is the blog post. Long distance running provides a rich supply of analogy and metaphor for writers to plunder when talking about their craft. Haruki Murukami squeezed an entire book out of the idea (a very good book, too.) My slow trek through the streets of St Louis did not, if I am being honest, provide much by way of inspiring anecdote. My own marathon story really begins when I crossed the finish line. It feels like I can still remember every step of the last six or so miles of the race. All I could think about was how wonderful it would be to stop moving. They would pat me on the back, give me a medal and some chocolate milk, and – best of all – the pain would stop. I got the medal. I got the chocolate milk. But the pain didn’t stop. If anything, when I stopped running, the pain got worse. I only began to realize the full extent of how traumatized my limbs and muscles were when my brain no longer had to focus on propelling my body forwards. I hurt everywhere. I wanted to weep with disappointment. I am telling you this now because two days ago I sent the manuscript of my latest novel, FLIGHT RISKS, to my editor at Penguin. This book has consumed me for the best part of two years. It is the reason why I haven’t posted a single blog entry in months. When I’m writing, I seem to have very little space in my head for anything else – rather like my marathon brain, I have been wholly focused on the finishing line. But as I pressed “send” on Monday afternoon, I remembered what happened at the end of the race last October. I’ve made it, kind of, but there is still a long way to go. In other words, the pain has not yet stopped. First, there is the text itself. There will be editorial comments, lots of ’em. There will be rewrites, lots of ’em. There will be line edits and copy edits. At some point I will lock myself away and read the whole thing out loud. And of course there will be polishing, endless, obsessive polishing, until the document is finally ripped out of my despairing hands. Once the actual words are done with, there is everything else to think about – cover copy and jacket design, discussions about marketing and publicity (one hopes), blogging, social media, all that. Knowing my track record, there will probably be all manner of grief about the title. I will have to learn how to talk about my book for anywhere between 30 seconds and 30 minutes. The road to publication is going to feel even longer than those 26.2 miles around the streets of St Louis – which is really saying something. So yeah, the race is just beginning. I’d love to have you along for the ride. Well, you know I can’t wait to read the book. As much as I loved A GOOD AMERICAN, knowing FLIGHT RISKS is a coming-of-age story is totally my kind of thing. I totally understand the concerns about it all, but I also know you had concerns about A GOOD AMERICAN…and that turned out to edge out THE NIGHT SWIMMER as the book I liked and recommended most the year it came out. So I have high hopes for FLIGHT RISKS and hope, through the slog that is the marathon of editing, that some of those fears wane and you cross the finish line with another book not even needing chocolate milk and a pat on the back! Go Alex!! I’m thrilled to follow along as you travel this next marathon. Congrats! I’m thinking the post race beverage can be champagne this time around. Thanks for the inside scoop about your journey. I hope you aren’t given any grief about the title. It has been a juicy tidbit that has let my imagination run wild. I am excited to go along for the ride.